Fife Flyers are Scotland's sole representatives in Nottingham for this weekend's Elite League play-off finals. Todd Dutiaume's side face Nottingham Panther on Saturday, with the winners going on to Sunday's final. Coventry Blaze meet Cardiff Devils in the other semi-final. "Winning it would mean a great deal to the people of Kirkcaldy, especially for a team that's only been in the Elite League for the last five years or so," said Flyers' Kyle Haines. "We've been through our ups and downs, but for the town it would be amazing to celebrate something for them." 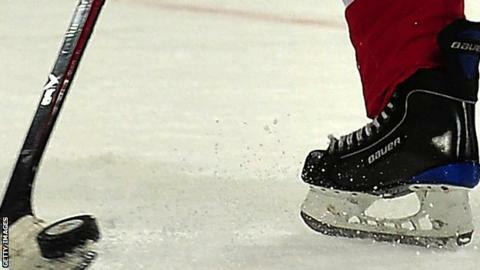 Flyers became the first Scottish team to qualify for the end-of-season showcase twice following two pulsating legs of a quarter final tie with Braehead Clan. Haines is one of three captains, with each sharing responsibility for leadership on the ice. It's a system that appears to have worked well this season and Haines, after two-and-a-half years at the club, is well versed on life in Kirkcaldy. "Instead of having the one captain and three alternates, we've ran with three assistants this year, including myself," explained the Canadian defenceman. "It's nice to have that pressure taken off me. It's nice to spread the leadership around a bit. "Sharing the role means the responsibility is equalled, but if we were to win it, I don't know who would lift the trophy. That's a good question. We'll discuss it later on I guess." Dutiaume first joined the club in 1998 and played in the Grand Slam team of 2000. Since becoming head coach in 2005, the Canadian has grown with the club as they joined the Elite League in 2011. "It's huge that our Brits, Kyle and Danny Stewart all bring experience to the squad this year to a lot of guys that maybe haven't faced the one-off situation we have here. "As a group we were naïve two years ago on the back of a long winning streak and Belfast stopped us in our tracks as we lost 1-0 in that semi-final. "This year we go there with that experience, draw from it and go there clear in our mind about what we want to accomplish. "We're going there better prepared and really looking forward to it as more than an experience. "I've never made an issue of being called an underdog and I think it's a big tag to wear. If we can bring that same intensity and play, I think we're in with a chance."